Canon is releasing a new compact, web-enabled printer that's designed to make printing photos from smartphones and tablets easier and cheaper. The PIXMA MG4150 is a Wi-Fi enabled all-in-one with features designed to appeal to students and families. Priced at £119, it's pitched as an affordable solution, too. Its space-saving design and front-loading paper and ink cartridges mean that it can be placed against a wall or on a shelf, while its high-gloss finish will ensure it can 'fit into the most stylish of homes', according to Canon at least. Capable of printing a 10x15cm borderless photo in approximately 44 seconds, the MG4150 can also notch up ISO speeds of 99lpm for mono documents and 5.7lpm for colour. FINE print head technology gives up to 4800dpi resolution with a minimum 2pl droplet size. 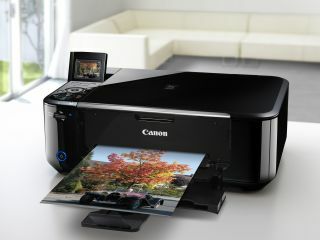 Canon's Easy Photo-Print app enables wireless mobile printing from iOS or Android devices, while the PIXMA Cloud Link offers direct printing of images stored online in Picasa albums or Canon Image Gateway. A built-in 6cm LCD display dispenses with the need to connect it to a PC. The MG4150 purports to be big on style, but low on environmental impact. As well as Auto Power Off/Quick Start functionality to save on energy, its features an 'ECO' setting that monitors paper and CO2. Auto Duplex Print mode offers paper-saving efficiency by automatically printing on both sides of the page. Rounding off the package is a range of creative software options, including Fun Filter Effect, for adding effects such as Soft Focus to prints, and Merge Frames, which lets you combine multiple stills from an HD movie to create a print with a sense of motion. The PIXMA MG4150 UK price is £119 and it is available from March 2012.